A phase I/II study of external beam radiation, brachytherapy and concurrent chemotherapy in localized cancer of the esophagus (RTOG 92-07): preliminary toxicity report. Gaspar. A multi-institutional, prospective study was designed to determine the feasibility and tolerance of external beam irradiation plus concurrent chemotherapy and esophageal brachytherapy (EB) in a potentially curable group of patients with adenocarcinoma or squamous cell carcinoma of the esophagus.Planned treatment was 50 Gy external beam radiation (25 fractions/5 weeks) followed 2 weeks later by EB [either high dose rate (HDR) 5 Gy, weeks 8, 9, and 10, for a total of 15 Gy, or low dose rate (LDR) 20 Gy, week 8]. The protocol was later revised to delete the LDR alternative, owing to poor accrual, and to decrease the HDR dose to 10 Gy (i.e. 5 Gy, weeks 8 and 9). Chemotherapy was given weeks 1, 5, 8, and 11 with cisplatin 75 mg/m2 and 5-fluorouracil 1000 mg2/m per 24 h, 96-h infusion. Life-threatening toxicity or treatment-related death occurred in 13 (26%) and 4 (8%) of the 50 eligible patients, respectively. Treatment-related esophageal fistulas occurred in three patients (12% overall, 14% of patients starting EB) at 0.5-6.2 months from the first day of brachytherapy, leading to death in three. No correlation was found between the development of fistula and location of primary tumor, brachytherapy active length or applicator diameter. So far, 5 of the 6 treatment-related fistulas have occurred following 15 Gy EB. The other fistula occurred after only 5 Gy of a planned 15 Gy was delivered. CONCLUSION: Thirty-five patients (70%) were able to complete external beam, EB, and at least two courses of chemotherapy. Estimated survival rate at 12 months is 48%, with an estimated 11-month median survival rate. Survival following external beam radiation plus concurrent chemotherapy and EB does not appear to be significantly different from survival seen following external beam radiation and chemotherapy only. American Brachytherapy Society (ABS) consensus guidelines for brachytherapy of esophageal cancer. Clinical Research Committee, American Brachytherapy Society, Philadelphia, PA.
Gaspar. Recommendations were made for brachytherapy in the definitive and palliative treatment of esophageal cancer. (A) Definitive treatment: Good candidates for brachytherapy include patients with unifocal thoracic adeno- or squamous cancers < or = 10 cm in length, with no evidence of intra-abdominal or metastatic disease. Contraindications include tracheal or bronchial involvement, cervical esophagus location, or stenosis that cannot be bypassed. The esophageal brachytherapy applicator should have an external diameter of 6-10 mm. If 5FU-based chemotherapy and 45-50-Gy external beam are used, recommended brachytherapy is either: (i) HDR 10 Gy in two weekly fractions of 5 Gy each; or (ii) LDR 20 Gy in a single course at 0.4-1 Gy/hr. All doses are specified 1 cm from the midsource or mid-dwell position. 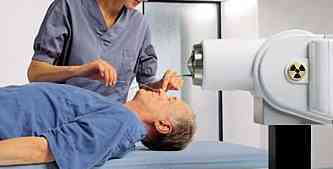 Brachytherapy should follow external beam radiation therapy and should not be given concurrently with chemotherapy. (B) Palliative treatment: Patients with adeno- or squamous cancers of the thoracic esophagus with distant metastases or unresectable local disease progression/recurrence after definitive radiation treatment should be considered for brachytherapy with palliative intent. After limited dose (30 Gy) EBRT, the recommended brachytherapy is either: (i) HDR 10-14 Gy in one or two fractions; or (ii) LDR 20-25 Gy in a single course at 0.4-1 Gy/hr. The need for external beam radiation in newly diagnosed patients with a life expectancy of less than 3 months is controversial. In these cases, HDR of 15-20 Gy in two to four fractions or LDR of 25-40 Gy at 0.4-1 Gy/hr may be of benefit. CONCLUSION: ABS guidelines for esophageal brachytherapy now exist and will be updated by the ABS in the future, as clinical data using more uniform treatment techniques becomes available.